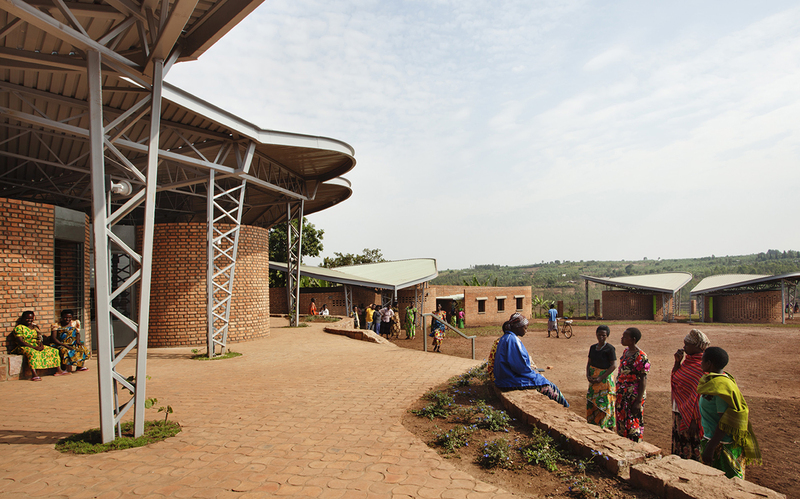 THE WOMEN'S OPPORTUNITY CENTER IN KAYONZA, RWANDA. "HOW DO YOU GO INTO A COMMUNITY AND NOT BE PRESUMPTUOUS ABOUT YOUR TAKE ON WHAT SHOULD BE THERE?" A present-day genocide is something hard for many of us to grasp. In 1994, some 800,000 Tutsi and Hutu sympathizers were brutally murdered over the course of three and a half months, by members of the Hutu majority. This horrific act of genocide was a product of the Rwandan Civil War (which began in 1990), and became breaking news through BBC updates and NPR shorts. The genocide committed by the Hutu’s left the majority of Rwanda in utter destruction. Communities were leveled, families were displace and broken, leaving behind a deserted group of women who had not only lost their loved ones, but experienced inhuman brutality. For these women, the war left deep scars, few resources, and uncertain futures. Women for Women International (WfWI), a nonprofit organization that directly aids women in conflict-affected countries, has been on the ground in Rwanda since the beginning of their civil war. Currently, they bring aid to over 300,000 women in countries like Iraq, South Sudan, Nigeria, & Rwanda. WfWI plays a major role in supporting women who have been abandoned and abused by these wars, crossing volatile boarders to respond to survivors. Through a year-long program, they provide emotional support to each women and help them to develop skills for economic independence, and take on important leadership roles in their local communities. 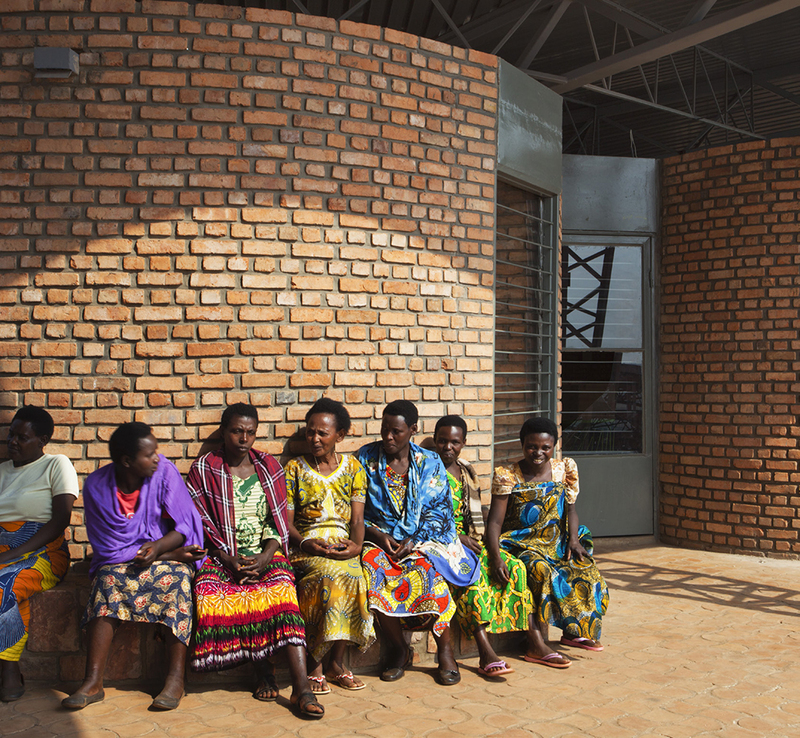 When WfWI decided to create a center for these women to heal, develop skills,and come together in Kayonza, Rwanda (where over 12,000 of their program graduates are), they approached Sharon Davis. Already having done a smaller center for WfWI in Kosovo, Davis was no outsider to the sensitivity of the project. 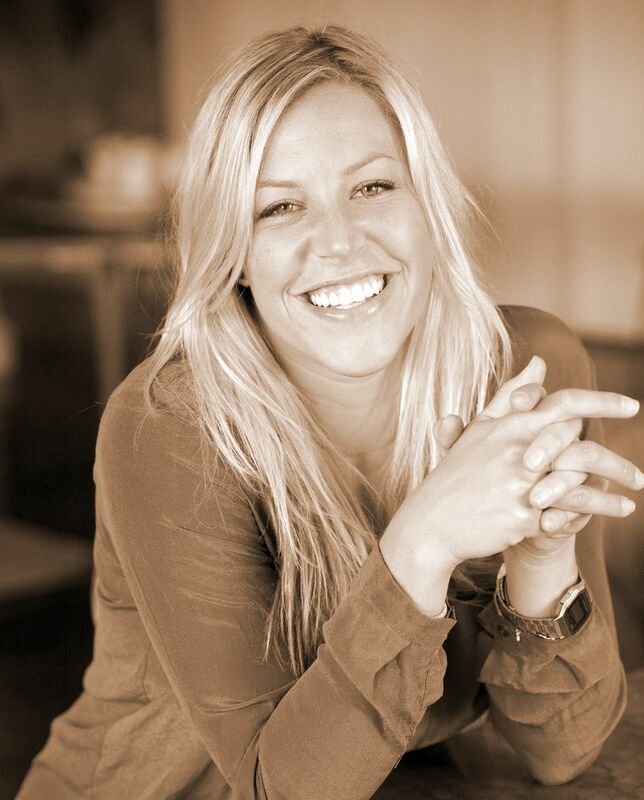 “There’s the initial question you have to consider: How do you go into a community that you don’t know and not be presumptuous about your take on what should be there?” she tells me one afternoon as we discuss working in remote developing communities. Sharon Davis Design has a strong commitment to sustainability for their residential and commercial projects. 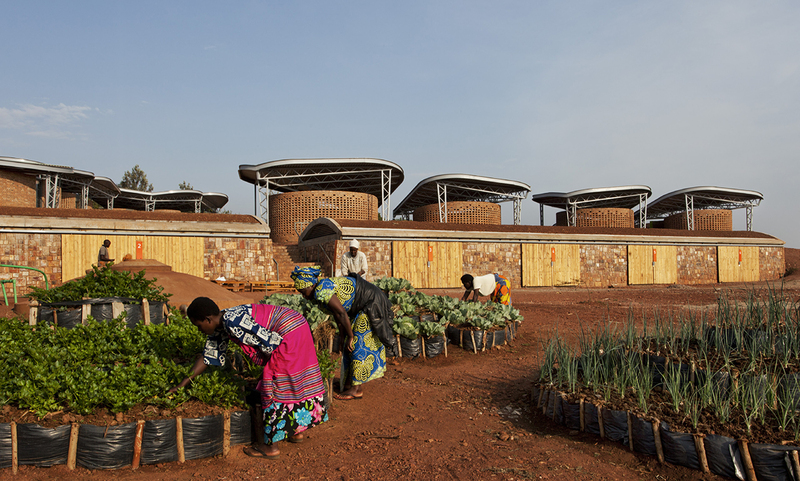 But WfWI’s ambitions for the center in Kayonza challenged the firm to include both social and economic longevity, adding some new elements to Davis’ pursuits of sustainable design. With a career in finance before coming to architecture, Davis took a more holistic approach to the project and assembled a group that included environmental engineer Eric Rothstein, structural engineer Arun Rimal, landscape designer Julie Farris, and designer colleague Bruce Engel (who currently is based in Rwanda and lives near the site) to address the broad needs of the project. 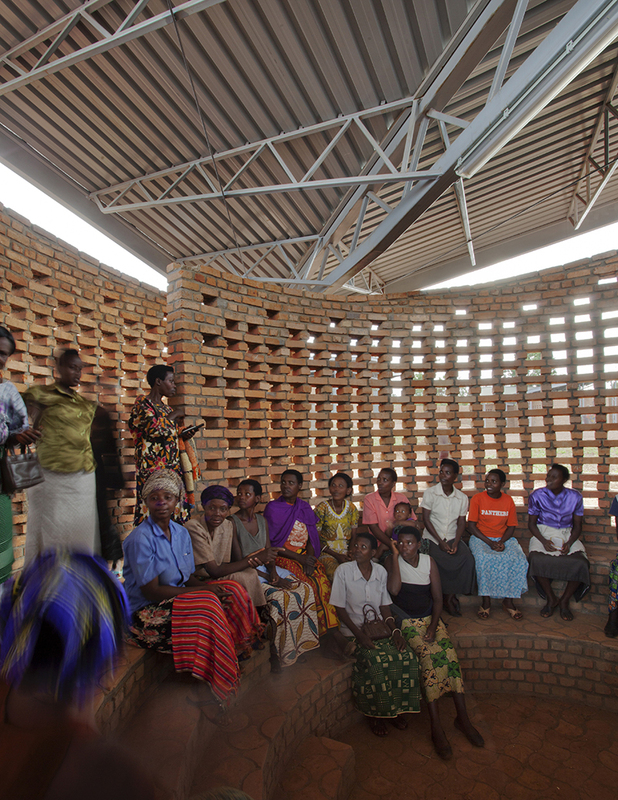 After discussing the many architectural humanitarian projects in the region that are disconnected and debilitating to their communities—a term the group coined “drop-in architecture”—the team committed to providing a more effective response to women’s needs in Kayonza. 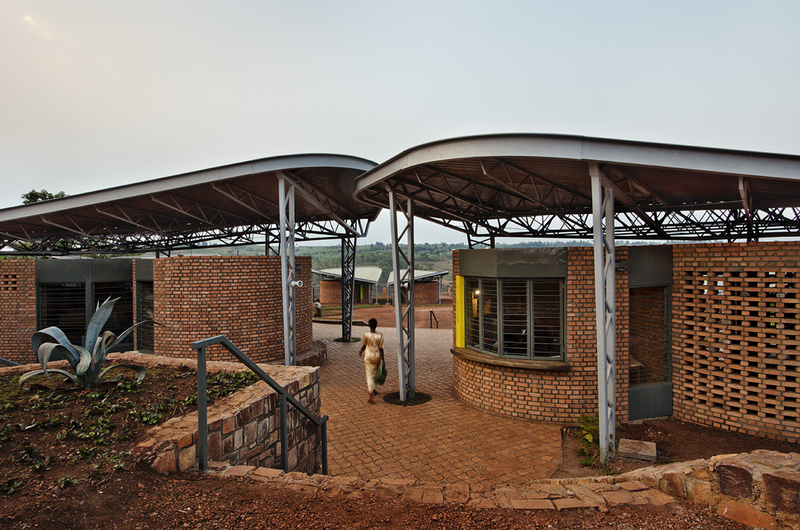 Their hope was to develop a new approach to humanitarian architecture: one that showed how design could not only produce a building, but also empower social and economic change. Davis’ team was unanimous about one element from the start: they had to go there. During the studio’s first visit to Kayonza, their first step was to begin meeting with local craftsmen to discuss design. 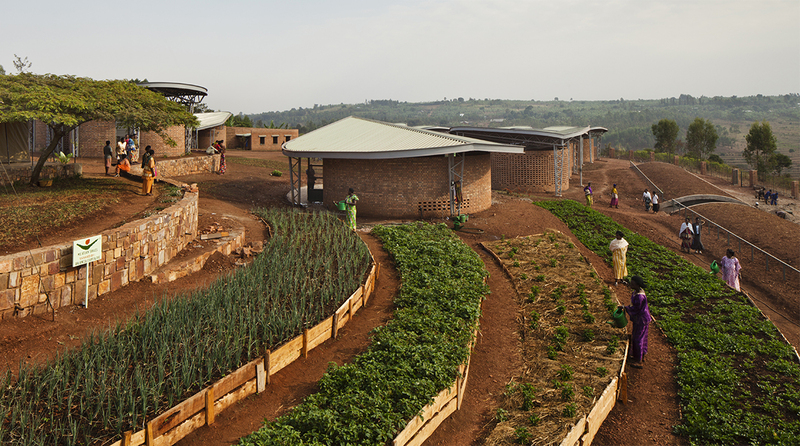 Davis remembers thinking, “none of the architecture there looked Rwandan,” a realization which catalyzed her pursuit of designing a uniquely Rwandan center. The team became aware of the shapes and objects around them—the woven patterns and common circular shapes of Rwandan crafts and textiles inspired the direction of the new design. But most importantly, they listened—they wanted to learn more about the existing hardships of the community. “I just felt like the most important thing that I could do on my first visit was be really humble, and really open,” Davis recalls about her first introduction to the community. Through their conversations and growing understanding of the community’s needs, the team concluded that a nice looking building simply wouldn’t do. This project was about much more than just architecture. WfWI had many visions for the new center—they not only wanted to create a space where the women could congregate and develop community, but also to provide professional development for the women of the community. These desires arose from one of the major WfWI program goals: to create economic independence and vocational value through the development of marketable trades and skills. As a response to this goal, the completed center would include gardens where the women could learn farming and harvesting, a kitchen where they could cook together, and a market where they could sell the products they grew. The team also made a move that many feel was a game changer: they taught the women to make bricks, and hired them to make those that would be used to build the new center. Not only would it keep labor in the local community and create a sense of ownership for the project, but it would also give the women an opportunity to learn and practice a skill they could later rely on for income. Instead of having a humanitarian group come in and build something for them, the women would construct it themselves, engaging in a process that would define their critical presence and role in the center moving forward. Davis’ business background again proved valuable, giving her a deep understanding of the economic ramifications of this decision. “One of the things you learn in studying economics is that building is an economic driver. If a country is in a recession, you know it’s coming out of the recession when you start to see building numbers come up.” In fact, it’s what Davis and many others call a, “leading indicator,” which describes a way to predict future economic growth as employment increases. After realizing that materials would be expensive, but creating jobs would make a profound impact on the local economy, they sought a solution that would create jobs and use less materials. Brickmaking was the ideal solution to this equation. It would require minimal materials, but a great amount of skilled labor. And by having the women do it, it would introduce an entirely new group of artisans into the local market. So brick by brick, that’s precisely what they did. WE HAVE A DUTY TO BETTER RESPOND TO THE REAL NEEDS OF COMMUNITIES. Images from the construction of the WOC and how brickmaking took place. 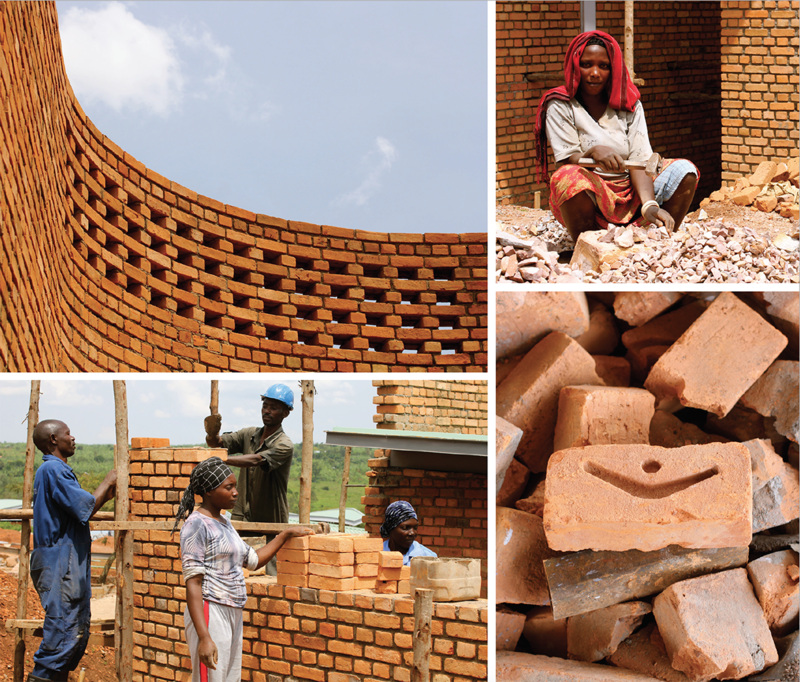 The brickmaking process used for the Women’s Opportunity Center was technically quite simple, but thoroughly researched and carefully executed.Bruce Engel, the team’s on-site member, studied brickmaking techniques in developing countries,which differed slightly from existing techniques in the area. Typically, bricks in the community were made by mixing soil and water and packing the mixture into molds—though often on uneven surfaces. Water-to-soil ratios often differed, and many bricks cracked during the firing process. In fact, until recently, these bricks were solely used to fill in walls, rather than hold structure. Additionally, all brickmakers were men. 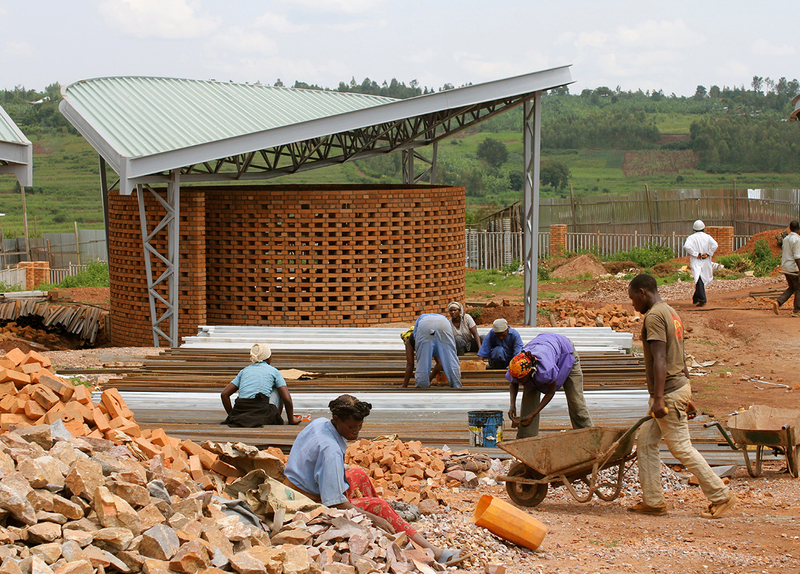 When the brickmaking process was set up at the Women’s Opportunity Center, a separate pit was created for mixing, level tables were used for forming, tents were set up to allow the bricks to dry before being fired, and bricks were positioned in the kiln with the utmost accuracy to assure the highest efficiency of production. Their process was so effective that it became well known in the local region, in fact, the latest job postings for brickmakers in the area actually offers women that worked for the W.O.C. a higher wage, likely due to their product’s high level of craftsmanship and structural integrity. Davis recalls revisiting the older brickmaking operations after the women had begun theirs at the W.O.C. site, “they now have tables, and they now have tents, and they now have women.” A brief second passes. “They’re still not as good as ours,” she later laughs with the hint of a proud smile. process that the water goes through as it travels to large cisterns buried deep underground to keep the water cool and available for any extended dry periods. 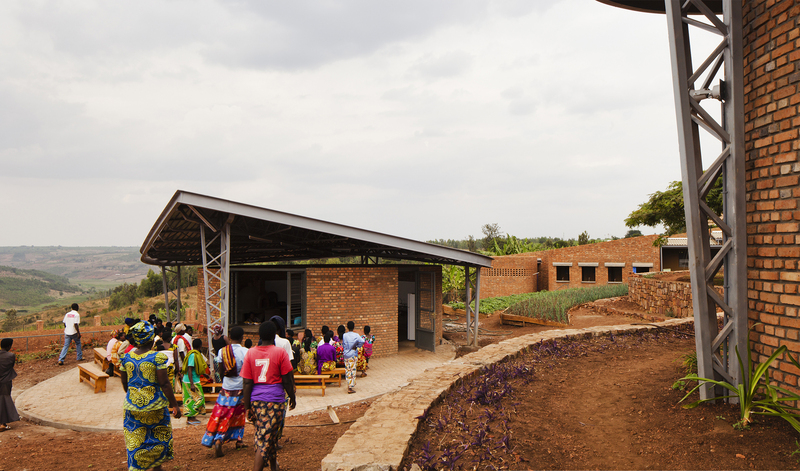 The Women’s Opportunity Center, as well as a number of other new projects in the region, including MASS Design Group’s Butaro Hospital and Doctors Housing and Asa Studio’s Gasanze pre-primary school, exhibit a new way of design thinking. A mentality that uses design as a mechanism to respond directly to larger needs of the community by creating jobs, reducing the spreading of diseases, and improving the quality of education. These projects reflect a new revelation of many designers: that we have a duty to better respond to the real needs of communities. While, historically, conversations of successful architecture often followed the contours of progressive forms and detailed ornamentation, current conversations seem to converge with community issues such as politics, health, and education. And indeed, as an expanding collection of projects start to show how issues such as social division, limited resources, and safety can be addressed strategically through good design, the demand for designers to play a part in more civic roles will rise. Conversly, design processes must include members of the community beyond architects. These projects were successfully achieved, not just by developing a deep understanding of the community’s needs, but also by the architect’s desire to collaborate with the local community to develop knowledge of subjects beyond architecture. With these revelations at hand, and these projects standing as built examples, it’s important that we come to expect this from new design in developing communities. While these strategies have major potential in metropolitan cities like New York City and Seoul, their effect is more marginal in a place like Kayonze or Kigali. New design projects in these developing communities must respond to more than just a need for structure, using the building process as a way to empower, heal, and employ the local people. Celebrating the official opening of the Women’s Opportunity Center in June 2013, the team behind the W.O.C. hopes to continue this way of thinking as they move forward with a new nonprofit endeavor: Big Future Group, which they founded as a way of continuing our collaborative work with developing communities. Next up for the Big Future Group:the renovation and expansion of a hospital in rural Nepal. If the result is anything close to their work in Kayonza, it’s sure to be worth a closer look. Women harvest vegetables from the Center's on-site farm.